For this exercise, you will simulate the 2D wave equation on a square mesh in realtime to produce drum-like sounds. This year we will add a nonlinear effect related to the instantaneous tension in the mesh. We will also compare drum sizes that can be simulated in realtime using HPS and FPGA. Relevant lectures from 2017 might be lectures 13 to 17. But remember that lab 3 in 2017 is lab 2 today. Read Study Notes on Numerical Solutions of the Wave Equation with the Finite Difference Method. The main result you will need to simulate is equation 2.18. Where the first term (sqrt(2)) corresponds to the fundamental mode of the drum. The first few modes are 1, sqrt(5)/sqrt(2), 2, sqrt(10)/sqrt(2), sqrt(13)/sqrt(2), sqrt(17)/sqrt(2). Modifying the boundary conditions, damping, wave speed, drum size, and distrubution of input energy can modifiy the sound of the simulation from drum-like, to chime-like, to gong-like or bell-like. You can modify the program further to include frequency-dependent damping and other effects. This version simluates a long, thin bar struck at one end. Adding tension modulation allows pitch bending observed in a real drum after a large amplitude input. The large amplitude means that the membrane is stretched more, and therefore the speed of propagation (and therefore pitch) is increased. This matlab code produces an exagerated pitch effect with initial high amplitude. See also PHYSICALLY-BASED SYNTHESIS OF NONLINEAR CIRCULAR MEMBRANES equation 10. The hardware audio interface is a Wolfson WM8731 codec which is controlled by an I2C interface. The Qsys AVconfig module abstracts away much of the codec detail. The codec fast data transfer hardware is hidden behind Altera IP called the University Audio Core for Qsys (configuration interface). An example using the audio core is near the bottom of the Avalon Bus master page. Cyclone5 handbook describing available hardware, but here is a summary. Also read documentation on incremental compilation. Some compile times may be very long. Evans and Sutherland HDL guide, chapter 9, for info on using generate. Simulate one node with four zero-value boundary conditions. Result should be simple harmonic motion. Remember that rho<0.5. Start with rho=1/16. so that the sine wave is on the border of aliasing, and therefore looks like a square wave. Assuming1:17 fixed point, start with initial conditions, un=un-1 and amplitude about 1/8 full scale. for a 24x24 (or greater) grid using no more than 174 multipliers. Get 10x10 array running using the audio codec on the FPGA for demo in second lab. You will want to refer to the Bus Master page, Audio output bus_master example. Also refer to the DSP page. Scale up parallel processor to 40x40 or greater. Required audio output with nonlinear rho. Modify the code for the nonlinear rho effect. This will require rewriting the solver to use fixed point multiplies. Get a finite difference scheme running using the audio codec on the FPGA. Required audio output with nonlinear rho. Scale up HPS solution until it is no longer realtime. 2008: Matt Meister and Cathy Chen wav file. 2011: João Diogo Falcão, growing grid, old MacDonald. The growing grid starts at 7*34*4=952 nodes, (#columns*#lines*symmetry), and ends at 254*34*4=34544 nodes. 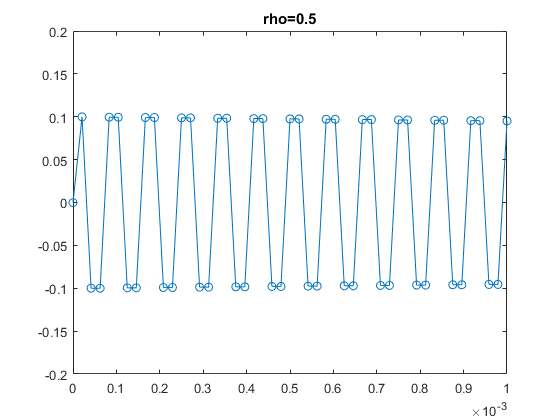 This is with Rho=0.5 and Eta=0.000244. 2014 Saisrinivasan Mohankumar, Ackerley Tng, Ankur Thakkar, eta = 0.0002, rho = 0.5 and 0.25, boundary gain =0, Number of nodes = 89x257x2 ( rows x colums x symmetry) = 45746 nodes. Last year the highest number of nodes was around 80,000 on DE1-SoC. -- Simulate a 10x10 (or greater) linear grid to produce a sound by exporting the wave file to matlab. Use synthesizable Verilog running in simulation in ModelSim. -- Show the number of cycles necessary to solve the audio sample. -- Also demo the HPS producing a nonlinear drum sound through the FPGA audio codec. -- Show the time that the HPS uses to solve the audio sample. -- Simulate the nonlinear PDE solver for a 24x24 (or greater) grid using no more than 174 multipliers. 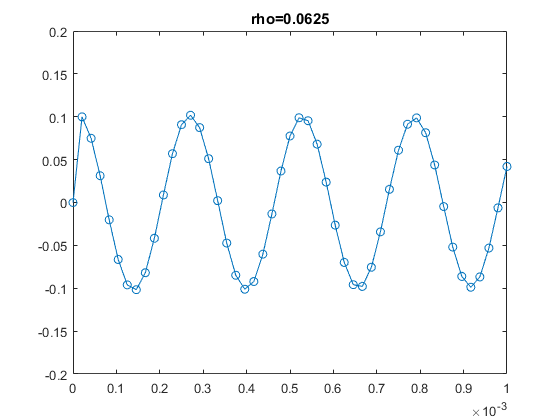 -- Use the simulation waveform to produce a sound in matlab. Week 3: demo full FPGA system below and compare to HPS. Build a realtime drum solver which produces sound from the audio codec interface. Minimum FPGA grid size for full credit should be at least 40x40, bigger than the size that can be solved by the HPS in realtime. The grid should have no more than 4:1 aspect ratio. Grid expansion via symmetry does not count for size. The solver on the FPGA should solve the 2d wave equation to produce selectable effects. A minimum of three buttons on the DE1-SoC should produce different timbers. Timber can be set by boundary condition, eta, rho, tension modulation, or number of nodes. At least one timber must include audible nonlinear tension modulation effects. There should be exactly one computational update of all the drum nodes for each audio sample. Each sample that you calculate must be output to the audio codec. 10*(number of wave equation nodes)*(audio sample frequency) . For a minimal 24x24 grid you will need ~276x106 operations/sec. Clearly some parallel processing will be necessary as you go to higher numbers of nodes. You can use fine-grained parallelism or course-grained multiprocessors on the FPGA side. You can output sound either by using a bus-master on the FPGA, or using the HPS to feed the audio codec. During the demo, prove to the TA that the computation finishes in less than 20.8 microseconds for the 40x40 or bigger drum you demo. Record the audio output back into matlab to show that your simulation matches drum modes (under the correct boundary conditions, etc). Be prepared to demo your design to your TA in lab. A table of grid size versus compute time for both the FPGA solver and the HPS solver. Do you see any cache-size effects on HPS? What is the effect of -O0 vs -O3? Are there any scaling surprizes in the FPGA? A heavily commented listing of your Verilog design (if you write a bus-master) and GCC code (if you use HPS).